Today we are highlighting science. Sarah at Share It Science asks "What is a Scientist?" and walks through a guided experiment using dancing raisins. Here we are also discussing the scientific method, with suggestions on how to develop experiments using plants. Are you familiar with the vocabulary of the scientific method? Do you know the following terms as they are used in science? If not, you might want to start with the following resources. If you have children ages 6 - 9 years, you definitely will want to consider picking up the new picture book Mesmerized: How Ben Franklin Solved a Mystery that Baffled All of France by Mara Rocklif and illustrated by Iacopo Bruno. The author captures a moment in history and reveals how Ben Franklin tested a peculiar case involving man in France who claimed he could cure people of illnesses by waving a wand. The author introduces young readers to the scientific method and to the placebo effect with concrete examples (for a full review of the book, see our sister blog, Wrapped in Foil). Excellent book! For older children, you can brush up on the scientific method at the Growing With Science website, where we discuss the process and give an example of experimental design for you to assess. Now, let's put the scientific method to work. The great thing about the scientific method is that you can apply it to almost any question about the natural world. Today we're going to apply it to questions about plants. It is possible to buy commercial root viewers, which have clear sides to allow viewing of a growing plant’s roots over time. However, they can be expensive. Design your own root viewer from recycled clear containers and then perform experiments in them. Go through the recycling bin and look for clear container that might make a root viewer. It should be at least four inches deep to allow the roots to grow properly. If it isn't an ideal shape, think of a way to modify it. How will you hold the seeds in place? You might want to try either wet paper towels or moist potting soil, depending on the size of the container. If you are using soil, either punch some drainage holes in the bottom or cover the bottom with a layer of pebbles for drainage. Then fill about 3/4 with soil. 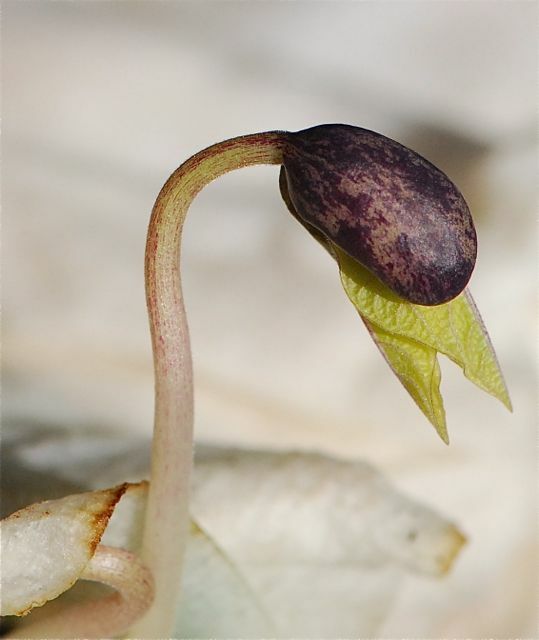 Place several different kinds of seeds against the inner walls. (If you are in a hurry, you could try planting sprouts.) Cover the seeds with about 1/8 inch soil. Water as needed to keep moist, but not too wet. Now is an opportunity to make some observations. Can you see the roots growing? What do the roots look like? Do they have colors? Do they have hairs? 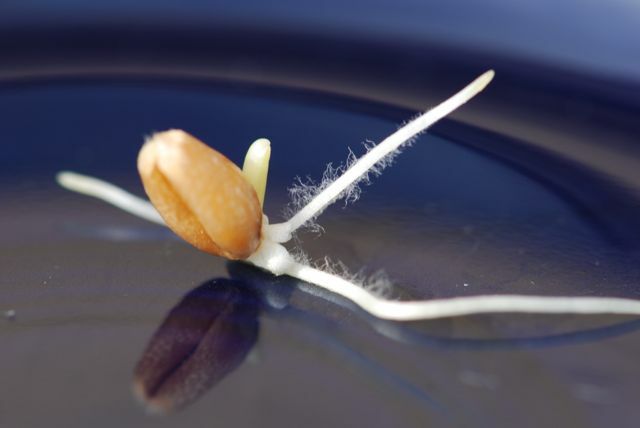 Which kinds of seeds started growing roots first? Measure the roots every day and graph root length over time. Do the roots grow the same amount every day? Do the roots of some plants grow faster than others? Do the roots of different kinds of plants grow into different shapes? For example, do some grow straight down, or do they branch like a tree? Do some roots look like a mop when they grow? Once you have perfected your containers, it might be time to do some more advanced studies. 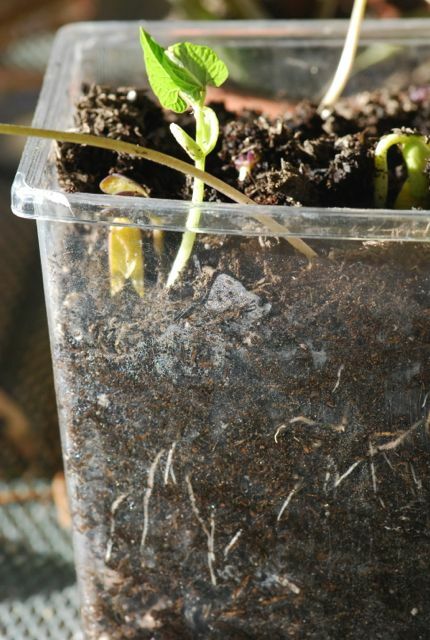 Using only one kind of seed, what happens if you cover the bottom of container so the roots are in darkness versus are exposed to light? What happens if you gently turn the container on its side once the roots have started? Do the roots continue growing in the same direction or do they resume growing down? If you try these experiments and choose to do so, we would like to hear your results. Do you have any suggestions for other studies you could try with a root viewer? Think about what plants may need to grow and then design an experiment to test some of your ideas. Check the Growing with Science website for information about the scientific method and how to design an experiment. For example, does the amount of water matter? You might try watering some plants with 1 cup of water, watering others with only 1/4 cup of water, and give others no water at all. Do plants really need light? You could keep some plants in the dark by covering them with a cardboard box and keep some in the light. You could also compare growing plants under different kinds of light bulbs. What about fresh air? Could you put some of the plants in tightly sealed plastic bags to see if they need fresh air? Can you leave out the soil? Can you grow plants in a kitchen sponge or wad of moist paper towels instead of soil? Compare how much they grow to plants grown in soil. You can also investigate how many seeds to plant in each container. Do plants grow better alone, with a few other plants, or with a lot of other plants? Write down your experiment. What is the question you want to ask and what is your hypothesis (tentative answer). Also, figure out how many containers you will need. If you are using milk cartons, cut off the tops with scissors. Poke a few drain holes in the bottom. If you want, you can do an experiment where you leave drain holes out of some of the containers to see if you really need drain holes. Important: Label each container with the permanent marker so you can remember which treatment it is. Fill the cartons with the soil or growing medium you have chosen. Plant the seeds. Water those you have chosen to receive water. Cover the ones that are to be dark, wrap in plastic those that are not going to get fresh air. Check every other day to add water as necessary and record your results by measuring the height of each plant. Which plants grew best? What conditions do plants need for proper growth? Can you think of any other variables to test? What about hot versus cold temperatures? What about giving some plants fertilizer and other none? Carry out your experiment and record the results. Write up your experiment and share it with others. Learn all about science with The Franklin Institute's online resources. Ask A Biologist at Arizona State University has biology-related lesson plans and other resources for educators. ScienceFriday has a Science Club with weekly science challenges. The Lawrence Hall of Science offers experiment ideas, as well as information for educators. Science Buddies specializes in science fair projects, but has a wealth of ideas for experiments.